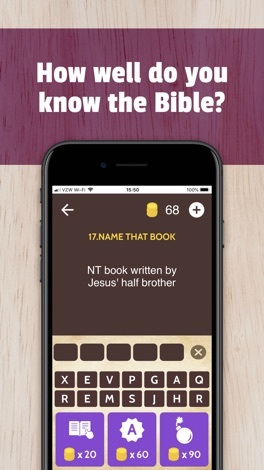 Bible Trivia is the most fun you'll have studying the Bible! Earn points for correct answers and use special bonus items to advance in the game. Q. I can't hear the audio. How do I get it to work? A. Make sure to have the vibrate button set to ringer & volume up. Another option is to use headphones. Q. Which translation are you using? A. We are using ESV . 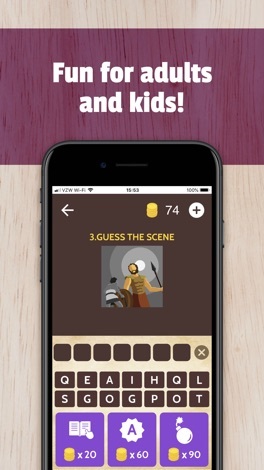 Test your Bible knowledge by guessing the word… with all clues created from Bible verses! Don't just take our word for it. More than 100,000 people have played the game! * "Love it! Never boring. 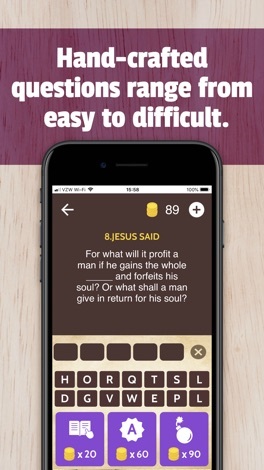 Best bible trivia game I've tried so far." -5 Stars! * "Loved it Great for the whole family.We play when we are traveling in the car. Its great to see the family so excited and involved. Thanks for a great trivia game!" -5 Stars! * "I love love this. What a fun way to test and learn the bible. If u don't know a passage, it shows it to you right then. It also encourages you to find the answers to questions yourself by providing hints.. Awesome game! REALLY!" 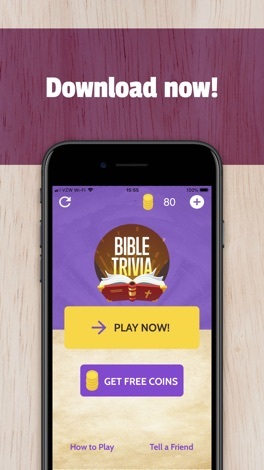 Bible Trivia is the highest rated Bible game for both iTunes and Google. Play it for yourself to find out why! 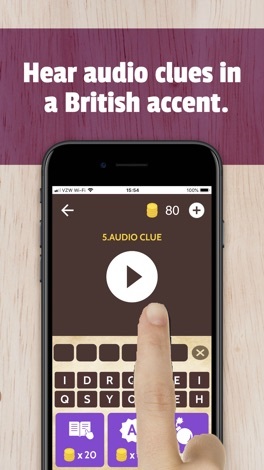 - Hear audio clues spoken in a British language. You need to download JUST for that alone! - See the explanation of where of the answer came from! If you like Bible Trivia, please consider giving it a 5-star rating after you updated it as the ratings get reset after each version. Your 5-star ratings and reviews will help keep the updates coming! Thanks for your support. - Supports iOS 11. - Supports iPhone X, iPhone 8, iPhone 8 Plus. - Supports iPad Pro. [Battery Forecast Pro] • Guide Your Usage Battery Forecaster Pro will guide your usage to prolong your battery life. • Tailored to You Learn your battery usage pattern. Accuracy improves with more usage data. • New UI New UI for new features!